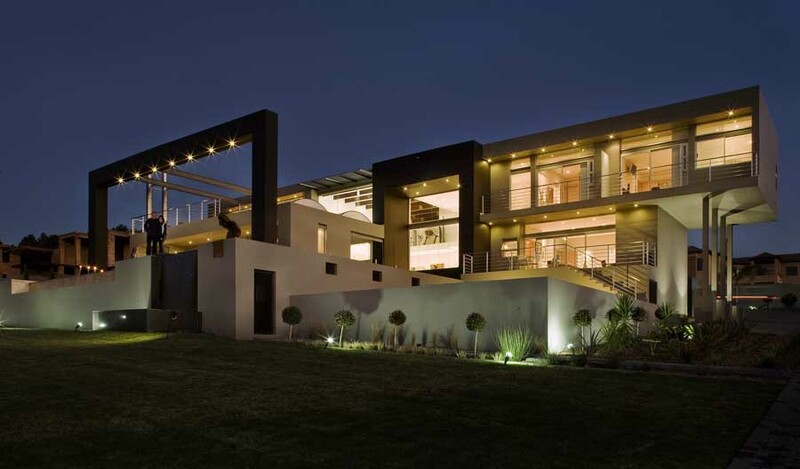 Drawing inspiration from local architect the result is a linear homestead with large verandas and monopitched roofs. 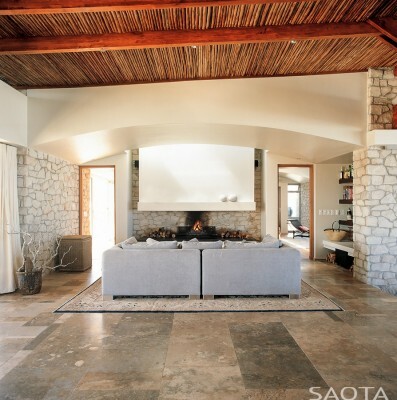 In contrast, natural colours and materials were used, using warm sandstone, ash-grey Balau woodwork and a charcoal metal roof. 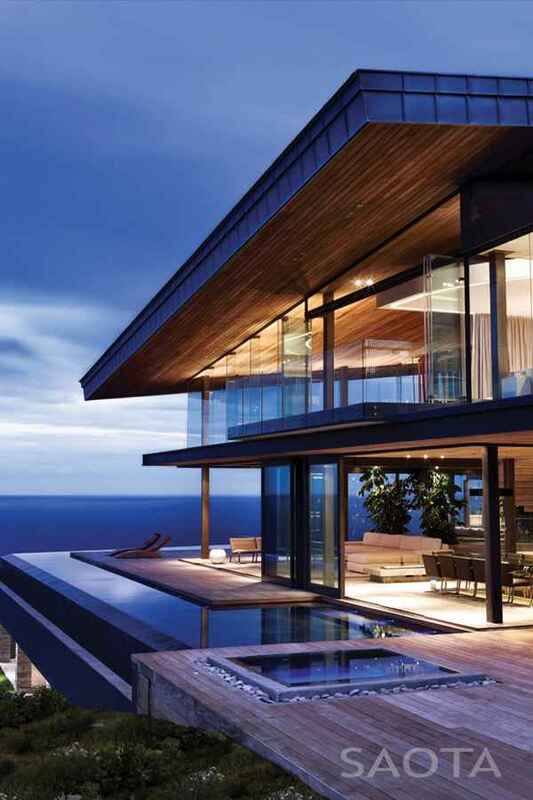 The location of the site permitted large glazed areas and extensive use of outdoor spaces, with each aspect of the house having a private terrace or deck. The contrast between solid stonewall panels, large openings and the delicate infill roofing gives the house a sculptured feel. 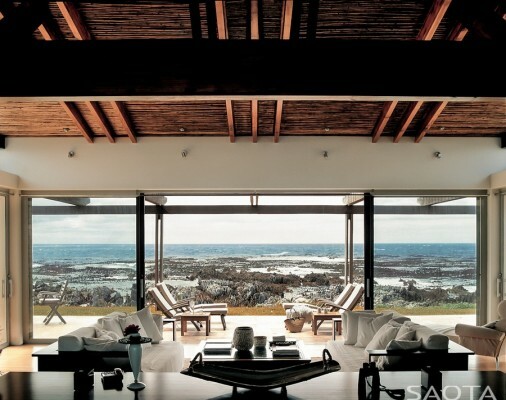 The open plan linear composition of the interior spaces allows views from every room. 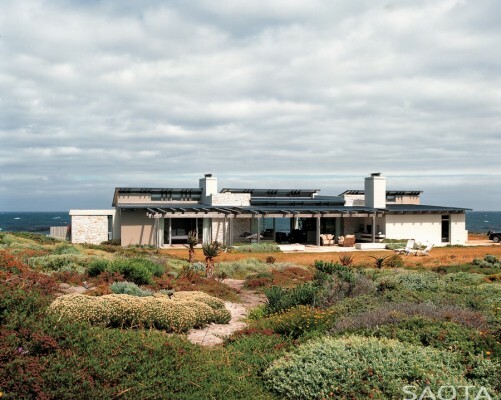 To take advantage of the sea and surroundings, Hangklip Mountain views and to provide protection from the extreme Cape Coastal climate, the living spaces were designed with north-south orientations, resulting in an open flowing space with sea and mountain terraces. 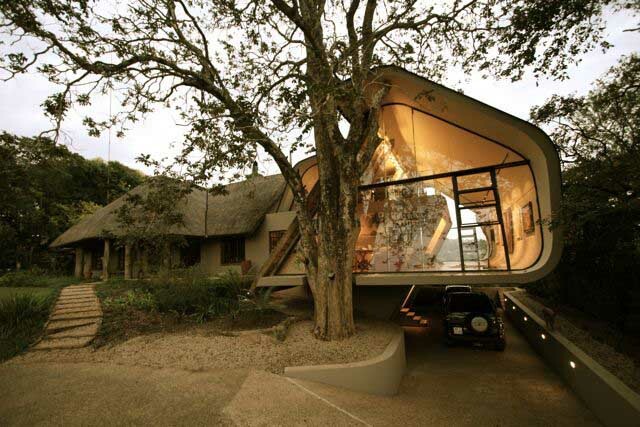 This allows the house to live on both sides with the main living spaces forming the link between inside and outside. The orientation gives the owners the option of entertaining on the mountain/dining terrace side during poor weather conditions and on the living/sea terrace side on sunny days. The through-views also ensure that one always experiences the beauty of the sea and mountain. The dining room which is the focus of the family’s activities is flanked on either side by deep sculptured “contained elements”, clad in the sandstone finish. 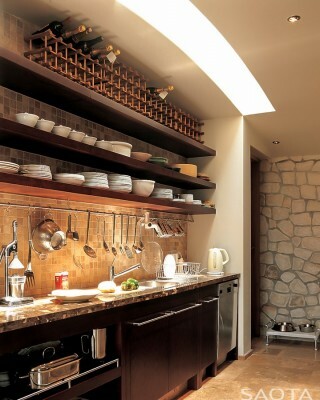 These arched chambers function as the kitchen and fireplace alcoves. Concealed skylights at either end bring light into these spaces and there is the constant play of shadows and filtered light. 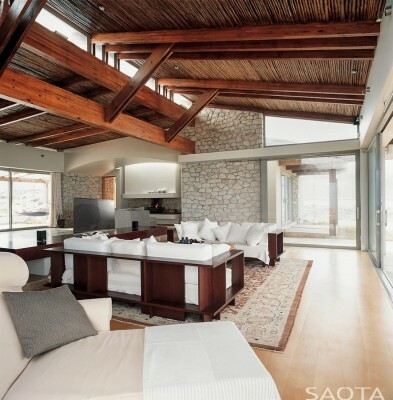 The living room is located on a split level with a high ceiling and clerestory windows. 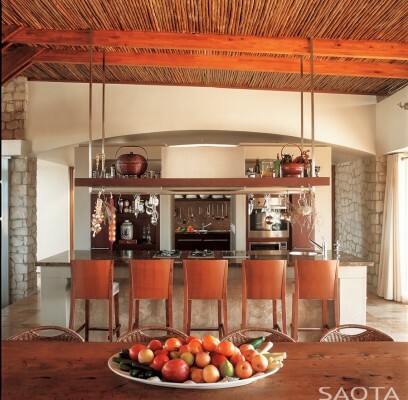 Heavy timber roof rafters have been exposed in these areas and the ceiling has been finished with “latte”, a material traditionally used in the construction of thatched roofs. The ceiling texture is soft and natural. Clerestory windows open to improve air circulation on hot days, and provide ventilation when bad weather does not permit the use of the large glazed openings. 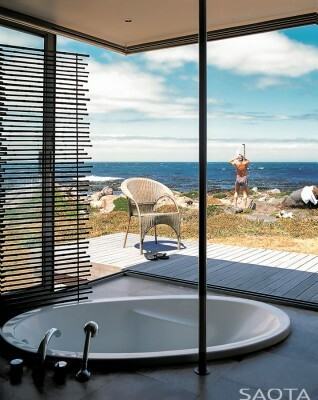 Two showers are provided by timber screens constructed of “latte”. A guest bedroom and garage / utility room are located on the mountain side. House SPRECHER is a dream that has been realised after our family fell in love with the SEA FARM site. We had found a piece of heaven and wanted a house that was deserving of this location. 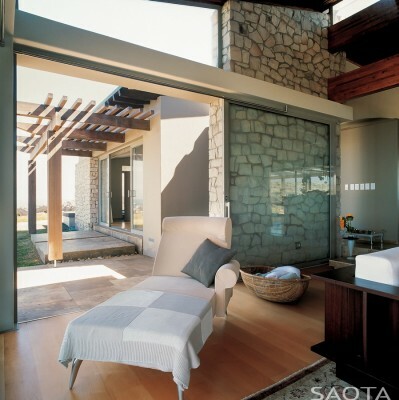 Our brief to SAOTA (Stefan Antoni Olmesdahl Truen Architects) was a contemporary holiday home that took full advantage of the views. The house had to make for easy living. 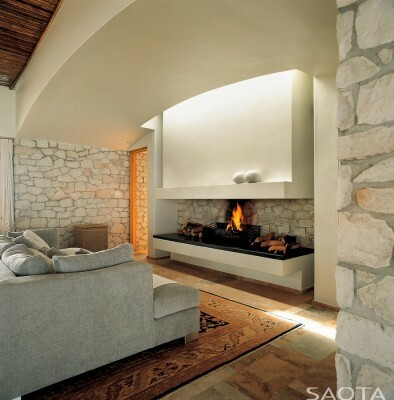 The focus was the entertaining, living areas that had to be relaxed and informal. We had certain criteria such as an open plan kitchen which had to be part of the family living rooms, and larger terraces with some deep shaded areas. Another request was a feature fireplace. From our first meeting with the architects we were seduced and inspired by Stefan’s vision and interpretation of our ideas. 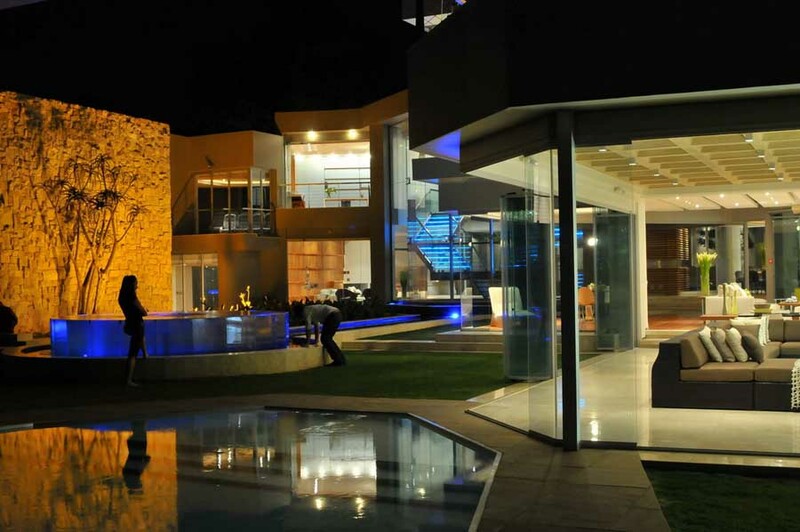 We were ecstatic with the plan of the house and its orientation on the site. 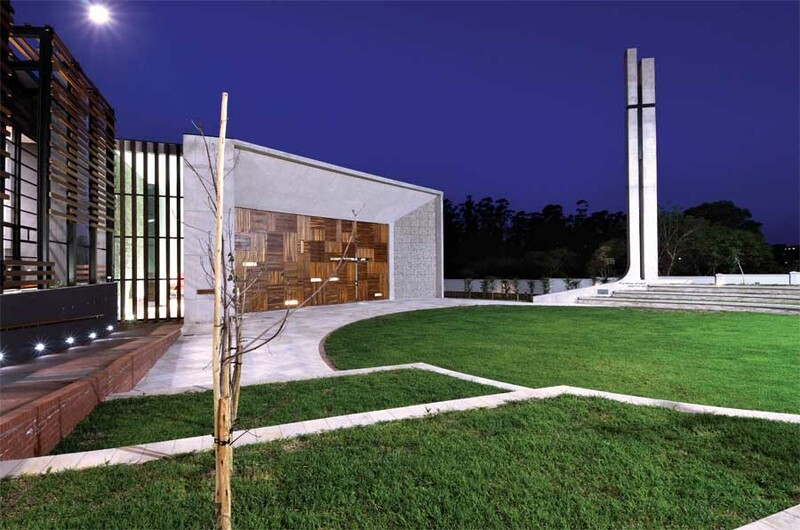 The through-views and larger openings allow each room to capture a special piece of the site. The linear shape and low pitched roofs allow the house to blend into the surroundings successfully. The order of the rooms perfectly reflects how our family functions, with private suites located to either side of the family rooms. 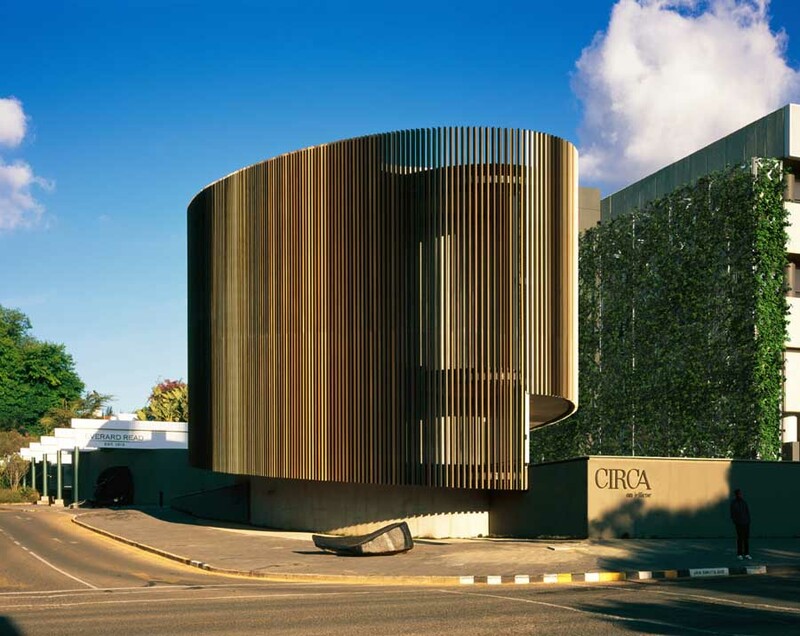 The materials and finishes selected were inspired by the nature of the site. 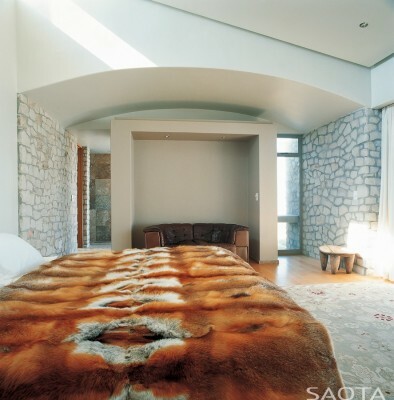 These are still very contemporary, but give the house the holiday rustic feel that we wanted. 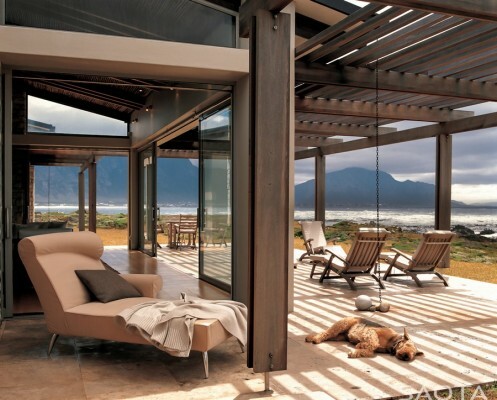 House Sprecher fulfils all our requirements and has captured the essence of what a holiday home in South Africa should be.